1. Spherical roller bearings are inherently self-aligning and very robust. The two rows of rollers make the bearings able to carry heavy loads. With the same center as the bearing, the spherically formed outer ring raceway can make self-alignment. Their rolling elements linearly come into contact with the raceways of inner ring and outer ring. The Spherical Roller Bearings can take great radial load. 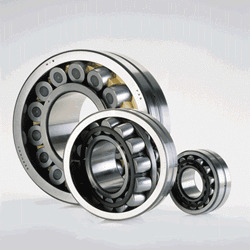 More recently a range of sealed spherical roller bearings has been added to the assortment. Split spherical roller bearings are usually based on the standard bearings but can be customized as required. 2. Spherical roller bearings are made for heavy-duty applications. They feature two rows of symmetrical barrel rollers which can align feely in the spherical outer ring raceway, thus compensating for shaft defelctions and misaligment of the bearing seats. Spherical roller bearings have a maximum number of long rollers with a large diameter. The close contact between the rollers and raceways yields a uniform stress distribution and a high load carrying capacity. For particularly punishing applications, e.g. where vibratory stresses have to be accommodated, we offer special spherical roller bearings with narrow dimensional tolerances and an increased radial clearance. 4)In general, this type of bearings permits a low limiting speed. Injection molding machines, crane hooks, vertical pumps.